The Buckeye or Horse Chestnut tree (Aesculus californica) reminds me of my native California. Its white flowers are a signal that spring has arrived; and when the leaves drop in July, it’s a signal that the scorching hot weather has begun. In Europe, the Red Horse Chestnut (Aesculus x carnea) is very similar to the California variety except its flowers are pink and the leaves drop in the Fall. After the Linden tree, the Red Horse Chestnut is probably the most common street tree in Berlin. 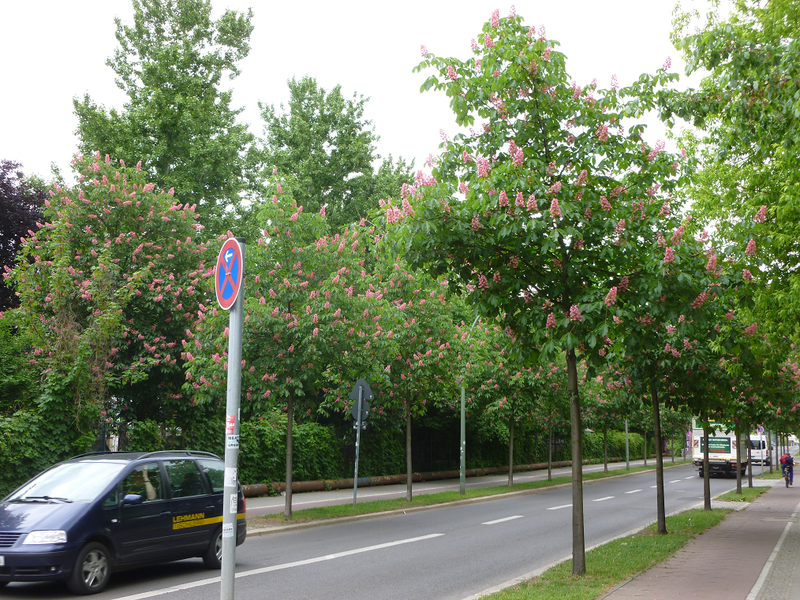 Berlin is trying to add more trees to the city, and their work is beginning to pay off. All over town, I’m seeing a lot of newly planted trees. It certainly softens this gray and rather cold city.